I had lunch at Chez Fung, located just minutes away from my home, with the fellow Singaporean mesdames. One of the Mrs is a regular, so Regina, the usually friendly proprietress was even more effusive in her welcome, chatting easily with us and bringing dishes of chili sauce she knew we would appreciate. The food too was comforting though a little unconventional and un peu chère. 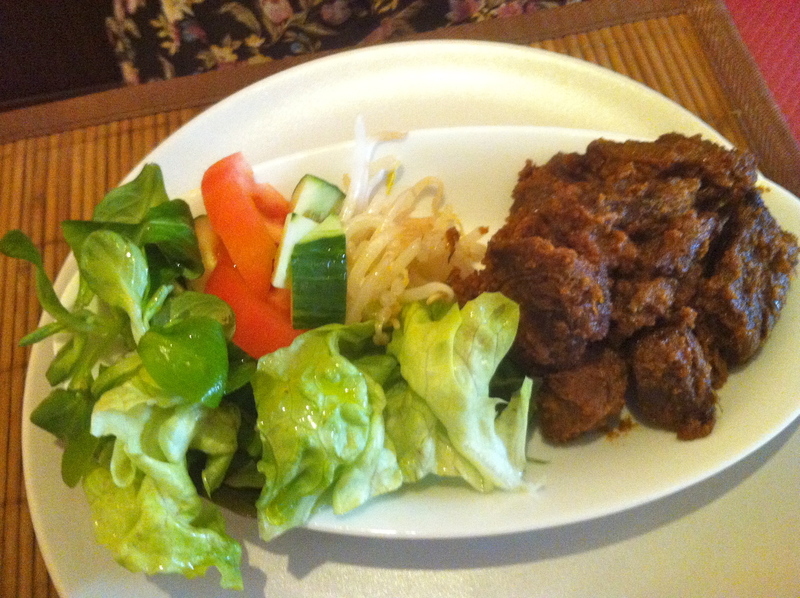 The most authentic dish was definitely the dry beef rendang, piquant and aromatic, with the beef slowly stewed to a tender mass. More appropriate names for the menu-listed Mee Siam were Mee Goreng or noodles on a hot plate, a large tangle of fried egg noodles topped with a chock-full of fresh and juicy seafood. A tasty, if inauthentic noodle dish, though the 19 Euros price tag when the bill came jolted us out of our post-lunch stupor. We also tried a riff of Otak, Chez Fung’s version involving a whole filet of fish rubbed with a sweet chili paste, then steamed in a banana leaf parcel. 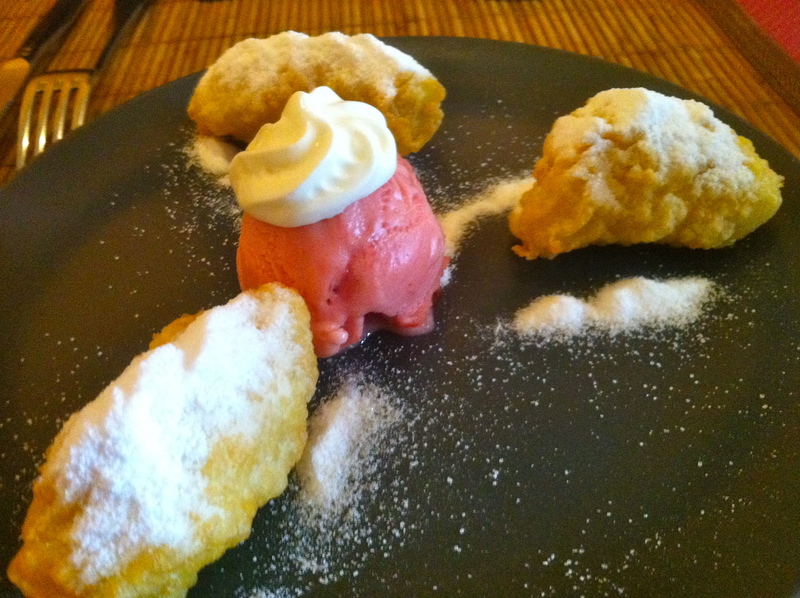 The Goreng Pisang’s batter was thick and slightly doughy, more reminiscent to those of ice-cream tempura than the original version, where the banana fritters are lightly crusted with a crispy and porous batter. Still, we finished it with gusto. All the Singaporeans we’ve met in Paris know about Chez Chung, an Asian traiteur on the edge of the 17th arrondissement that looks – with its counter of prepared foods and bare bones decor – like any other traiteur dotting the streets of Paris. The claim to fame? Authentic Mee Pok, Nasi Goreng and Char Kway Teow that could be ordered off the menu. Legend goes that Singapore Airlines crew members who lived in the nearby hotel taught the owners how to prepare these South East Asian specialities to ward off homesickness, and indeed we spotted some pilots and crew members having lunch on their off-days. The fried beef and seafood horfuns tasted great indeed with the elusive whiff of wok hei, and while the mee pok lacked the spicy/sour chili and vinegar based sauce I am so fond of, the bowl of noodles was nicely al dente with a melange of local toppings, the fish balls and fish cake surprisingly bouncy and tasty, all bounded by aromatic garlic oil. As a testament to how difficult it was to find a taste of home, one of my lunch partners ate her noodles and then brought home another 2 portions for dinner. Cooking Singaporean cuisine has become very easy ever since Prima Taste launched their line of packaged seasonings, adding to the line over the years such that I could now cook Chili Crab and Laksa without having to hunt for dried laksa leaves and other hard to find ingredients. I found a small selection of Prima Taste seasoning packs at Paris Big Store for those keen to try it at home. This entry was posted in 13th arrondisement, 15th arrondisement, 17th arrondisement, Asian, Cuisine, Eat out, dine in, eating out, food shopping, Location, Paris and tagged Paris, singaporean food. Bookmark the permalink.